The winners of the 2017 Mariano Gago Ecsite Awards have just been announced at the Opening Ceremony of the Ecsite Annual Conference in Porto by Sharon Ament, Chairperson of the Jury and Director of the Museum of London. TRACES – Espace des Sciences Pierre-Gilles De Gennes, Paris (France) won in the ‘Smart and Simple’ category for the Frugal Science exhibition, a smart, cost-effective project that proposes a new take on both exhibition making and tinkering. Dialogue Social Enterprise, Hamburg (Germany) won in the ‘Sustainable Success’ category for its Dialogue in the Dark exhibition concept, a long-standing success story with remarkable reach and an original and robust business model, true to our field's values of inclusion and diversity. NOESIS - Thessaloniki Science Center & Technology Museum (Greece) got a Special mention for courageous leadership for welcoming children from the refugee camps of Thessaloniki and their families and offering them a scientific, educational, cultural and social programme. 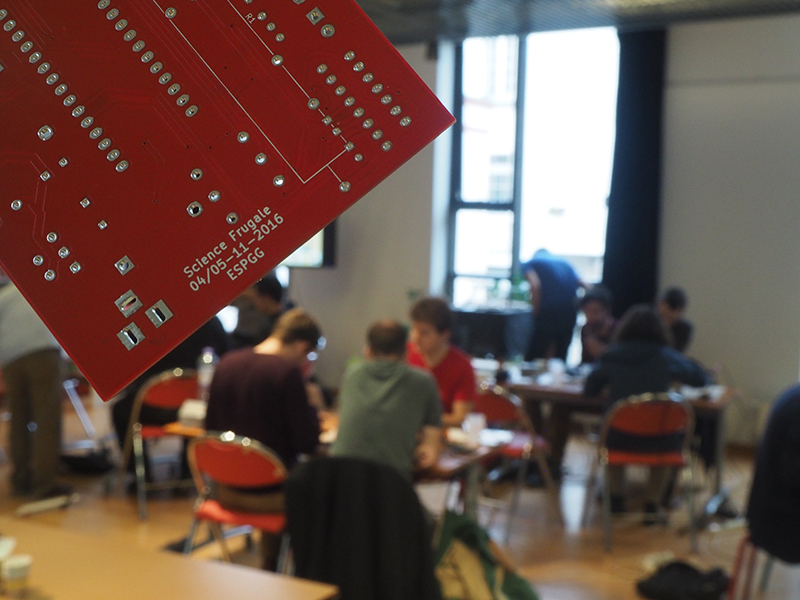 The TRACES and Dialogue Social Enterprise teams are invited to the 2017 Ecsite Directors Forum (4-6 October 2017, Paris, France) where they will share their experience in a workshop they will run for their peers. The Smart and Simple category celebrates simple, innovative and creative solutions in science engagement. It recognises the power of smart ideas that prompt a “I wish I had thought of that one!” reaction from other professionals – this is why nominations for this category were put forward by peers. TRACES – Espace des Sciences Pierre-Gilles De Gennes won the prize for its Frugal Science exhibition, still on for a few days at its Paris venue.“Science frugale” is a hybrid project: this forum-exhibition explores how to reduce the cost of scientific instruments through recycle, reuse and a lot of creativity. The project combined a constantly evolving gallery of smart frugal science projects from all over the world; a series of workshops and living-labs on the frugal approach to experimental science, bringing together researchers, creative professionals and the public; and a series of round tables, pitches, conferences, meetings etc. Most of the objects, stories, and reflexions displayed in the exhibition were created or framed with audiences during the exhibition’s life time. In a first “incubation phase”, the exhibition was open to the public as a “work in progress”, before a “development phase”, in which materials were organised in a proper, light design. A purposely hired “exhibition biographer” recorded and publicised the process, drawing pictures, writing short texts and social media posts that eventually became the graphic design and the texts of the “real” exhibition. 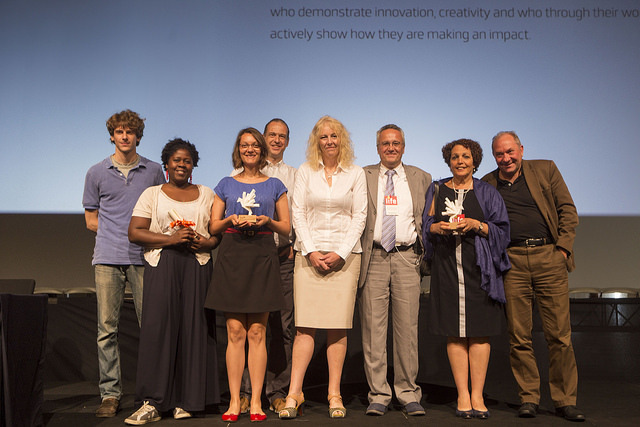 Dialogue Social Enterprise, Hamburg (Germany) won for its Dialogue in the Dark exhibition concept. Dialogue in the Dark is an exhibition in total darkness. 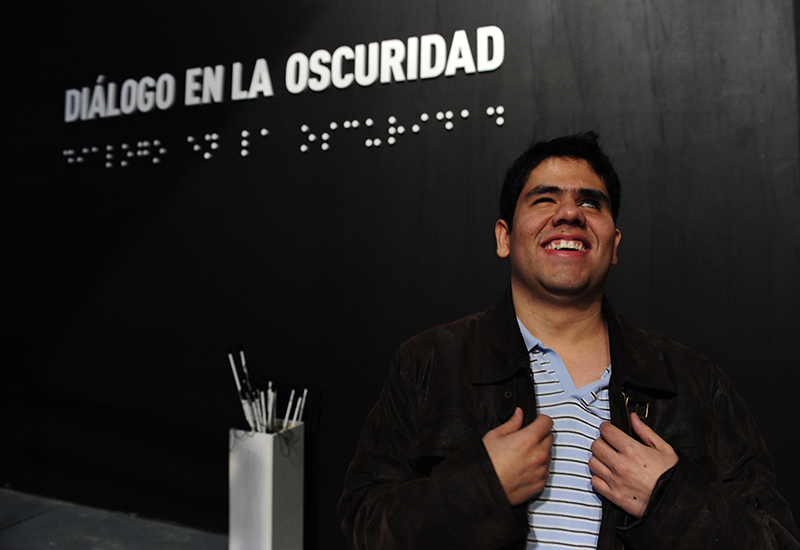 Visitors are guided in small groups by blind people through realistically recreated daily environments. A reversal of role happens: blind people can “see” while sighted people are “blind” during the duration of the exhibition visit. Dialogue in the Dark is not a simulation of blindness. It is an opportunity to meet blind people to overcome prejudices, stereotypes, ignorance, avoidance and insecurity. It is a sensorial journey that enlarges visitors’ minds with regard to non visual perception, unbiased communication, acceptance of one’s own limits and the importance of dialogue, trust, open mindedness and cohesion. The first Dialogue in the Dark exhibition was opened by social entrepreneur Andreas Heinecke in Frankfurt, Germany, in 1988, with the ambition to "change the attitude towards blindness, and create job opportunities for those who see differently". Thanks to a social franchise model, the concept has travelled to 180 cities and 44 countries since, reaching no less than 10 million people and giving 10,000 blind people employment and recognition. The exhibition now has two cousins: Dialogue in Silence, guided by deaf people; and Dialogue with Time, whose facilitators are aged 70+. The Dialogue Social Enterprise team are currently working on the next stage: a concept for MODI, a future Museum of Diversity and Inclusion. "We are delighted to receive this prestigious award that recognizes our unbreakable belief that exhibitions are catalyst for social transformation.The award honors and recognizes the work of the current 28 Dialogue in the Dark in the world but also all the former Dialogue in the Dark in the last 29 years." The Dialogue exhibitions are one of the case studies featured in the recent "Access: beyond ramps and large print" Spokes article. The Jury felt compelled to award a Special mention for courageous leadership to NOESIS - Thessaloniki Science Center & Technology Museum (Greece) for welcoming children from the refugee camps of Thessaloniki and their families and offering them a scientific, educational, cultural and social programme in their own language. This initiative is true to the science centre’s mission: “science for all!” and has been running in association with the office of the United Nations High Commissioner for Refugees (UNHCR), the Municipality of Thermi and of Thessaloniki, numerous non-profit organisations and the support of local companies. NOESIS is now looking into a more long-term programme, building on the children’s newly acquired language skills to help them mix with locals. The Espace des Sciences Pierre-Gilles de Gennes (ESPGG) was created in 1994, as the public venue of the prestigious Ecole Supérieure de Physique et de Chimie Industrielles de la Ville de Paris. It was a dream and a realization of the 1991 Physics Nobel prize Pierre-Gilles de Gennes, and it took its name after his death in 2007. The ESPGG is situated between a street of the culture district of Paris – the quartier latin – and a highly renowned research institution – ESPCI, home of 5 Nobel prizes, from Marie Curie to Georges Charpak, belonging to the city of Paris. Dialogue Social Enterprise is a social enterprise operating worldwide. Our mission is to facilitate social inclusion of disabled, disadvantaged and elderly people on a global basis. Disability is a rising issue and demographic change is considered to be a megatrend. The number of people with disability is growing due to an aging population and an increase in chronic illnesses related to higher life cycle expectancies. NOESIS – Thessaloniki Science Center and Technology Museum is a non-profit cultural and educational foundation that promotes Technology Culture and constitutes the proper environment for informing the public of the latest developments in Science and Technology.